So Where Am I Socially Situated on Google+? So, here’s a started for 10: a quick social positioning map generated around who folk who have added me to public circles on Google+ publicly follow… Note that for folk who follow more than 90 people, I’m selecting a random sample of 90 of their friends to plot the graph. 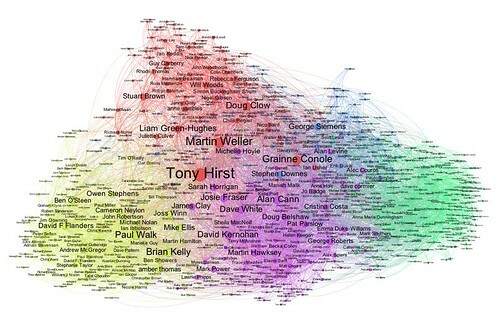 The graph is further filtered to only show folk who are followed by 5 or more of the folk who have added me to their circles (bear in mind that this may miss people out because of the 90 sample size hack). Given one of the major rules of communication is ‘know your audience’, I keep wondering why so many folk who “do” the social media thing have apparently no interest in who they’re bleating at or what those folk might be interested in… I guess it’s a belief in “if I shout, folk will listen…”? How do I get networkx in Python (OS X)? Do I have to do that each time or is the installation persistent? @alan the library should be available ever more without the need to reinstall..
Nice graph. What program do you use to render graphml?